Very good progressions within the drills. Lots of skills, breakouts and regroups. A good cross ice with Random Numbers from 1 to 3. A coach from the Czech Republic asked me to send him links to more pro practices. These are the ones I have posted plus a link to the YouTube pro drills and the Swedish progression. Pro Practice 7-5-16 - Development camp small group. 600+ Pro Hockey Drills - Short video clips from pro practices. Skills Progression from Swedish Federation. 150 short clips of every skill up to 3-3. Great for skill stations and some full ice situation drills. Yiiiiikes!! I just clicked a link on the top of the YouTube screen that has all of the hockey coaching videos I have posted there. That is a lot of material. PDF’s with diagrams and descriptions of most of the drill videos can be found here under the same coded title. Defender must skate hard to open ice to gain time and space to make an outlet pass and supporting players on the other end must get open. Defender work with the goalie and prevent the puck from crossing the ‘Royal Road’ and keep the puck to one side of the ice. 1. Two reds vs. two blue at one end and two blue vs. one red at the other. 2. This is a one puck transition game. 3. Start with the coach dumping the puck in and have more pucks on goals or the puck out of play. 4. Pass to team mate coming on when the whistle goes. 5. Play shifts of about 30’. 7. Either time the game or play to a score, i.e. First team to 3 goals wins. 8. Also play series like first team 2 or 3 wins. Create 2-1's on one defender. Protect the puck, get open for a pass. In a 2-2 there are all 4 game playing roles. 2. Support the puck carrier. 3. Check the puck carrier. 4. Cover players away from the puck. 1. Move the nets up to the top of the circles. 2. Blue F1-F2 start vs. Red F1-F2. 3. Coach shoot the puck in to start. 4. Coaches spot new pucks on goals or if the puck is out of play. 6. F3-F4's leave from the goal line on each. Defenseman must keep skating and pivot from backward to forward. Forward give support on the wall with a target. Everyone on the ice move the pucks. Forwards rebound for the next shooter on the 1-0 and go to the net after passing to the D on the 2-0. 1. Defense in the middle with pucks, forwards in the four corners and coaches at the blue lines. 2. Option one; D1’s skate backward with the puck from both ends of the circle. 3. F1’s from diagonal corners skate up to the red line and open up for a pass from D1. 4. Coaches give passive pressure at the blue line so F1 fake inside then go wide and shoot. 5. F2’s leave on the whistle from the other diagonal corners and repeat with D2’s. 6. Option two; coach or a player one touch pass to D1 while he skates back then repeat. 7. Option three; coach flip the puck high to D1 as he skates back and gloves the puck in front. 8. Coaches give up the blue line and deny wide entry. F’s read this and cut to the inside. 9. Option four; D’s join the rush, coach pressure wide, F’s delay and pass to D who takes the shot. Start practice with quick drills that everyone knows to warm-p with skating agility, passing, shots. Do everything with speed and good habits. Youth hockey players can do a couple of reps to develop skill. Pro’s use the same drills to warm-up and sharpen skills they already have. 1. Start with 5-0 breakouts at each end. 2. Coach rim the puck in so the goalie has to pass it. 3. Regroup with the coach who rims it the other way. 4. Everyone move pucks to diagonal corners at each end. 5. One end at a time three leave and shoot from the three lanes. 6. First skate straight down - shoot, third skate to the wide lane and shoot. Second agility around the circle then shoot from middle lane. 7. Start from the same place but do the Small Horseshoe 1-0. 8. Stop at the net for a rebound after shooting. 9. Switch corners and repeat the shots from three lanes and the small horseshoe. Youth players work with pro coaches on puck protection, cut backs, edge fakes and catch and release skills. Shoot the puck in for the goalie to handle from both sides and mix up rims and direct shots on the net. One forward support the D on the regroup on the strong side and the other in the middle. Attack 2-1 with speed and the principle: ‘One high one low, one fast one slow.’ Defense keep the play to one side and slide outside the post if the puck carrier goes past the dot. 1. Players line up on both sides in the neutral zone. 2. Coach at each blue line shoot the puck in or else either F1 or F2. 3. Goalie stop the rim or shot and make a pass to the D.
4. Breakout 3-0 with D1-F1-F2. 5. D2 follow the play to the blue line and skate backward. 6. F1-F2 regroup with D2. 7. D2 skate and make a pass to either F1-F2. 8. F1-F2 attack 2-1 vs. D1. 9. D2 go back for a pass from the goalie at the other end. 10. Repeat with D2-F3-F4 and D3 follow. *This same flow can be done 1-1, 2-1, 2-2, 3-2 or 1-2, 2-3 to work on those seldom practiced situations. D defend the rush and then join the next attack up the ice. Attack with speed. 1. F1 get a pass from the coach and attack vs. D1. 2. D2 follow the play to the point. 3. F2 follow the rush and get a new puck from the coach. 4. F1-F2-D1 attack 3-1 vs. D2. 5. D3-D4 follow the rush to the point. 6. F3 enter the zone and get a pass from the coach. 7. F1-F2-F3-D2 attack 4-2 vs. D3-D4. 8. F4 and D5 follow the rush. 9. F4 get a pass from the coach and attack 1-1 vs. D5. 10. Continue the sequence of 1-1, 3-1, 4-2. * The next progression is to turn this into a Transition Game starting with a 1-1, D2-F2 follow the play. D1 make a breakout pass to F2 and F1-D1 join the rush 3-1 vs. D2, F3-D3-D4 follow. D2 make a breakout pass to F3 and join the attack with F1-F2-F3 vs. D3-D4. Youtube list of links can be found at the link below. Players go to skill stations led by coaches. Forwards who take face-offs in the middle. Defense shoot at one end. Forwards at one end do in tight scoring drills. Defense face the play when skating sideways to shoot. Head up to read the checker. Make one touch passes for the one timer shot. 1. Coach pass to point-D1-Skate and pass to D2-D2 skate down lane-D2 back to D1-D1 shoot from mid-point. 2. Coach drops pucks for face-offs in the middle. 3. F1 cut in or go around the net and shoot, then screen the goalie for F2’s shot. 4. Coach pass to D1 who passes across to D2 who shoots. Alternate sides. 5. D1exchange passes with a coach at mid-point then slide and shoot. 6. D1 progress to exchange passes then slide without a puck and one time D2’s pass. 7. Coach rim the puck from the far corner; F1 pick up the rim and cut in or go around net and wrap. 8. Coach pass to D1 from mid-point; D1 across to D2 for a one timer. Black Aces are players who aren’t dressing for games, coming back from injury, don’t get much ice time or want to work on skills.Target skills for each player and consider whether they are playing in the games or recovering from injury. Do some team play drills together and add competition. 1. Skate around the circle with the puck and keep the feet moving. 2. Exchange passes with a coach and shoot one timers. 3. Exchange passes with a coach and shoot quickly from the mid slot. 4. Start with puck far blue line-red line-back to blue, skate down and shoot. 5. Coach rims a puck to a forward who picks it up, skates out of the zone and make a quick turn then go in and shoot. 6. Defense agility skate up and back then pass to coach x 3; quick up, counter and wheel. 7. Defense agility skate to the mid slot, get a pass from the coach and wrap the net x 3 each side. 8. Two D and two F regroup x 2, chip in on second regroup and shoot then pass to point x 2 and screen for point shots. Black Aces are those not playing in the game or coming back from injury. Pro and college teams carry extra players and usually the assistant coaches work with them at the end of practice or some clubs have skill practices that focus on fitness and individual offensive and defensive skills. 1. F1 go into the corner for a loose puck vs. coach, skate up the boards and pass low to F2, F1 get a pass in the slot and shoot. F1 screen for a point shot from D1. 2. F1 skate from the goal line to far blue line, around net to far blue, to near blue each way, to the low dots each way. Always turn towards the boards. F2 repeat. 3. 3. Coach work on short side low shots. 4. Goalie coach shoot from the high slot to all nine scoring spots. 5. Edge work around three circles. Inside and outside edges, Crosby heel to heel, big cross-overs. 6. Coach shoot from low in the corner. Goalie move from the middle to the post. 7. F1 skate wide and get a pass from F2 who is at the middle dot. F1 shoot then come back on the other side, exchange passes with F2 and take a shot. 8. F1 big figure 8 around circle to red line, circle around other circle, neutral zone 8, get pass from coach and shoot. 9. F2 start at blue line, exchange passes with coach at the far blue, turn and go in for a shot. 10. F3 start at blue and cut across middle while exchanging passes with the coach. Finish with a shot. D shoulder check on the way back to the puck. Everyone face the puck and forwards fill the three lanes. D must drive skate with the puck and read whether it is a pressure or contain forecheck. 1. Start with a neutral zone face-off 5 vs. 1 forward F4. 2. Coach throw the puck deep into the defensive zone. 3. F1-F2-F3-D1-D2 breakout vs. F3 who forechecks. 4. F1-F2-F3 skate up ice and regroup with D3 when they cross the blue line. 6. All race out of the zone on the whistle. 7. Next group come out of the box and repeat in the opposite direction. Quick up on the regroup and only go D to D if there is no play. Pass hard and one forward post up while the other give a target in the middle lane. 1. Start with the D at the blue lines and forwards in each corner. 2. F1-F2 attack with a low 2-1 vs. D1 while D2-D3 follow to the blue line. 3. Whistle and coach spots a puck on one side for a regroup. 4. D2 pick up the puck and make a quick pass up to F1 or F2. 5. F1-F2 attack 2-1 vs. D1 while D2-D3 follow. 6. Whistle and coach spots a puck on the other side for a regroup. 7. D3 quick up to F1 or F2 who attack 2-1 vs. D1. 8. Repeat at the other end with F3-F4 attacking D4 and D5-D6 following the play. Move the puck up ice as quickly as possible. Attack in the first 3” and the defense hasn’t had time to be well organized. Take more than 3” to attack and the defense is organized. Forwards must fill the three lanes and be ready to attack with speed. Quick up is the first option and D to D if the quick up isn’t there. 1. F1-F2-F3 skate red to far blue line and back D1-D2 skate near blue to red and coach dumps a puck in. 2. All five go back into the defensive zone for a breakout. 3. Attack 5-0 and the coach give passive resistance at the far blue line. 4. Attack with 4, a middle drive and one D as the trailer. 5. On whistle the coach spot a new puck inside the defensive end. 6. Regroup and attack 5-0 a second time. Protect the puck with the body, quick moves and changes of direction. This requires good skating technique, agility, puck control and shooting skills. Puck Protection 1-1, 2-1 in the middle zone. a. Protect the puck vs. a defender and try to score 1-1.
b. Start with a 1-1 and then it becomes a 2-1. Scoring from the low slot at one end. a. Coach pass, fake forehand shot then slide across and shoot forehand. b. Slide backwards around a pylon and take a backhand shot. c. Coach pass then slide the puck under the stick one way then the other way and shoot quickly. d. Coach pass then slide backwards and shoot on the forehand. e. Coach pass, stickhandle and agility skate around and through three obstacles and shoot quickly. Point shots at the other end. a. Coach pass and D drag and shoot by skating forward then backwards and take a forehand shot. b. Coach pass then D fake to the inside and skate back outside then shoot. Protect the puck, get the shot on net past the defender, make the goalie move. Shoot where the goalie is coming from and not where he is going. Shoot high if goalie drops, low if he is up, shoot quickly without extra stickhandling. Organization – Two nets on the goal line at one end, one net at the other and one in the middle against the boards. Station One – going to the net with the puck and screening. Start from the wide lane at the blue line. a. F1 pass inside to F2 who goes wide then hard to the net vs. passive resistance from F1. b. F1 pass from the corner to the coach then screen while the coach shoots. c. F1 get a pass in the corner, protect the puck skating up the boards, cut back and go to the net. defender. Forehand, backhand, forehand to backhand and backhand to forehand. Station Three – a low 1-1 and pass to a Joker who can pass or shoot from the point. b. D1 pass to F1 while D2 defends. c. D1 can pass or shoot but not skate in. Forwards must be able to take a pass off the boards and pass it to the player supporting low and slow from the middle lane. Defense must be able to read the forecheck and make the first outlet behind the net, in front or on the boards. 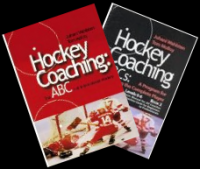 a.	F1 on one side and F2 the other side leave from the neutral zone and pass to a coach, face the puck while they pivot to the boards from a pass or a rim from the coach. b.	F1 pass to the coach who rims the puck and F2 picks it up, protect it from the coach who pinches and touch pass to F1 who swings low and slow. c.	F1-F2 skate to the neutral zone then turn back and attack 2-0.
a.	D1 go back for a puck from the top of the circle, shoulder check, hard fake and pass to the coach in front. b.	D1 skate up to the top of the circle then backwards, repeat and pass to the coach on the boards. c.	D1 repeat a third time and drive the back of the goal and cut up ice tight to the net. d.	D2 repeat the same sequence. e.	Coach walk though pressuring D1 who shoulder checks which side the coach is on and moves the puck the other way. f.	Coach dump in a puck and forecheck vs. D1 and D2. g.	Defenseman shoulder check to read which way the pressure is and skate away from the pressure. h.	D1 pass to D2 on the boards or behind the net. i.	D2 go back for the puck on the other side. a. D in the corner with a coach and forwards start in middle outside the zone. b. Coach 1 spot a puck below goal line and D1 at each end rim to F1 on the wide wing. c.	Coach 2 pinch on F1 and F2 mirror the rim and support F1 low and slow for a one touch pass. d.	Do this low breakout 2-1 from diagonal corners and then switch corners. * The next progression to work on this team skill is a half ice transition game of 2-1 with a dump in and pinch then move to a full ice transition game with a dump in. Players have to count to read the situation from 1-1 to 4-4 and all in between like 3-2, 4-2, etc. 1. Players wait outside the blue line in two teams and the coach says how many go the next whistle. 2. Play 20-30” shifts and keep score. 3. It is safer and promotes better habits if the puck is passed to teammates coming on instead of just leaving a puck and putting in a new puck. *Option one is to allow an outnumbered player to give and go with a waiting teammate who can join if the passes are successful. *Option two is have modified rules on the type of goals, i.e. only one touch shots or how many passes or how long with the puck, i.e. only two seconds with the puck and you must pass or shoot. 1. F1 pass from the blue line down to F2 skating up the boards from the corner. 2. Attack 2-1 vs. D1. 3. Whistle and coach spot a puck near the far blue line. 4. D2 go back for the puck and regroup with F1-F2. 5. F1-F2 attack 2-1 vs. D1. 6. D2 hustle back to the other end and defend a low 2-1 vs. F3-F4. 7. Alternate one end to the other. * You could use this flow from 1-1 to 3-2. The link below takes you to the table of contents. D move the puck up quickly and only do a D to D if the quick up is taken away. Forwards support from all three lanes facing the puck and giving a target. Attackers create a 2-1 vs. one D and attack with 4 players. Legendary Canadian coach Lloyd Percival called 5-2 the Magic Drill. 1. Coach spot a puck inside far blue, D blue to red and back, F red to blue and back. 2. D1-D2-F1-F2-F3 regroup and attack vs. D3-D4. 3. On the whistle go back and regroup again and repeat the 5-2 attack. 4. On the whistle coach spot a puck in the corner and start a new 3-2 attack from there. 5. F4-F5-F6-D5-D6 repeat and attack vs. D1-D2. Forwards give a target and don’t handle the puck but pass or shoot right away. Square up to the puck if shooting on the off wing for a one timer. F1-F2 follow the shot and stop in front for a rebound. 1. D1 skate forward, backward with a puck, across past two pylons, stop and skate forward then shoot between the pylons. 2. F1-F2 on each side skate from the bottom to the top of the circle, and coach pass to either F1-F2 who passes across and the other F shoot quickly. 3. D1 skate a figure eight around the pylons, always facing the net and shoot. 4. D1 skate blue line to the top of the circle, skate back to blue with the puck, exchange passes with the coach as he skates past the second pylon and one time shot the return pass. Defense take one timer shots and quick wrist shots. Forwards cut in around the coach and let the shot go while skating, then follow the shot. The two D practice the various D to D passes, over, reverse, drive the back of the net, etc..
1. Forwards at one end and defense at the other with coaches. 2. D2 dump puck in, D1 go back for the puck and pass to D2 across to D3 who shoots. 3. D4 dump puck in, D3 go back for a puck and pass to D4 to D2 who shoots. 4. F1 get a pass along the boards from the coach, cut in and shoot; F2 repeat on the other side. 5. D3 dump puck in, D1 go back and pass to D2 who passes to D4 at the point. 6. D4 across to D3 who shoots. 7. D1-D2 skate up to the point. 8. D4 dump puck in, D2 pass to D1, up to D3, across to D4 who shoots. 9. D3-D4 now go back for the puck to make D to D breakouts. Terry Johnson a former NHL defenseman who I have coached with at university and youth hockey helped me with conditioning camp practices this weekend. Last night he did a drill he said I used to run a long time ago and it is terrific because it creates different situations that the F and D have to recognize. One group had 27 skaters with 10 D. So we gave the option of more than one F leaving from the corner and alternate between one or two D. So sometimes the rush may be 4-1 or 4-2 at one end. It is a drill I will use a lot now and get a video. Both the defense and the forwards must read the game situation. It could be a 1-1, 1-2, 2-2, 3-2, 3-1 or if two forwards go there could be 4 on the attack on one side. Defender must learn to look and see who the next player up ice is to recognize if it is a 1-1, 2-1, 1-2 etc..
1. Forwards in diagonal corners and at the red line on each side and D in diagonal corners. 2. Start with F1 leaving from one corner and F2 from the other with a puck. 3. F1 pass to F3 and F2 pass to F4 who touch pass the puck back to F1 and F2. 4. D1 and D2 skate out past the blue line to defend vs. F1 and F2. 5. F3 make a decision to either to either join F1 on the rush or go across the ice and join F4. 6. F4 decide to either join F2 or go across and join F1 who is attacking vs. D1. 7. If you have more than four defenseman you can send 2 D to defend the rush on one or both sides. 8. You can also send more than one forward to start the rush or alternate one then two D or F.
Shoot while skating and face the puck all the time giving a target. Follow the shot for a rebound. 1. F1 leave from the blue line, give and go twice with the coach at far blue line, turn up the boards, get a return pass and go in for a shot. 2. F1 leave from the blue line, give and go twice with the coach at far blue line, open wide on the other wing, get a return pass and go in for a shot. 3. F1 leave from the far blue line and get a pass on the wing and shoot, come back through the middle, give and go with the coach then get a pass on the other wing and shoot. 4. F1 go in for the puck under coaches pressure and reverse it to F2. F1 go to the net for a pass from F2. F2 now pass to D1 who shoots and F1 screen. Forwards work on cut backs along the side boards and defense work on shots from the point and coming down the wall with the puck. Players screen, tip, rebound and shot pass from in front. 1. Defensemen work on scoring starting from the point. a. Get a pass then skate inside the dot and shoot. b. One player screen, tip or put in a rebound. c.	Fake inside and go back outside and shoot. d.	Skate inside then outside, down the boards and shoot. e.	Switch sides and repeat the sequence. f.	On backhand skate forward inside then turn and shoot. 2. Forwards work on protecting the puck along the boards and going to the net. A. Coach give passive resistance. B. Get the lead shoulder inside of the defender and go to the net protecting the puck with the body. C.	Repeat from both sides. Forwards at one end with a coach and D and some F at the other end with a coach. Scoring on one touch shots and one timer shots. 1. F1 in front one touch shoot a pass from F2 in the corner. 2. F1 get a new puck from F2, skate behind and pass short side to F2 who shoots. 3. F1-F2 make another play with any rebound near the scoring area. 4. F2 go to the front of the net and repeat with F3. 5. Forwards repeat from the other corner. 1. D1 exchange pucks with coach at the mid-point and skate diagonally for a one timer. 2. Coach pass to D2 who passes to D1 for the one timer shot. 3. F1 set up below the dot and one time passes from the coach. 4. D2 repeat and shoot the pass from D3. 1. Coach dumps the puck in. 2. D1 goes back for the puck and F1-F2 support from the strong side boards and middle. 3. D2 follow the play to the blue line. 4. D1 go back for the puck, shoulder check, turn up ice and pass to F1 or F2. 5. F1-F2 regroup in the neutral zone with D2. 6. F1-F2 do a second regroup with D1. 7. F1-F2-D1 attack 3-1 vs. D2. * This drill could be done from 1-1 to 3-2. * Another option is D1 jump into the attack and be part of a 3-1 middle drive.